alaTest has collected and analyzed 91 reviews of Panasonic HX-A500E. The average rating for this product is 3.7/5, compared to an average rating of 4.0/5 for other Camcorders for all reviews. People really like the price and size. The reliability and image quality are also mentioned favorably, but there are some negative comments about the zoom and color. 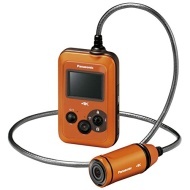 alaTest has collected and analyzed 12 user reviews of Panasonic HX-A500E from Amazon.co.uk. The average user rating for this product is 3.6/5, compared to an average user rating of 4.0/5 for other Camcorders on Amazon.co.uk. Reviewers are impressed by the reliability and design. The image quality and portability also get good feedback, whereas there are some less positive reviews about the color and battery. alaTest has collected and analyzed 14 user reviews of Panasonic HX-A500E from Amazon.com. The average user rating for this product is 2.9/5, compared to an average user rating of 3.9/5 for other Camcorders on Amazon.com. People are impressed by the portability. The price is also appreciated. Opinions are divided on the reliability. Many are critical about the usability and image quality. I'm motorsports and use this to capture different angles others don't even think to get. This is a very impressive piece of technology and a reasonable price. The commentator who suggested the Nitecore 25.4mm filters as a protective cap was spot on. They even make a little click when you put them on.
" Ran a Spartan Race with the A500 and it performed beautifully. It was comfortable, durable, captured great footage, and after about 10 minutes I forgot I was even wearing it. " " I've used this camera for amazing surf and ski videos. Simple to use and share and very good video stabilization. "